Happy Saturday to you. I have a fun project for you today and wanted to share various ways to add embellishments for a little extra pizzazz. 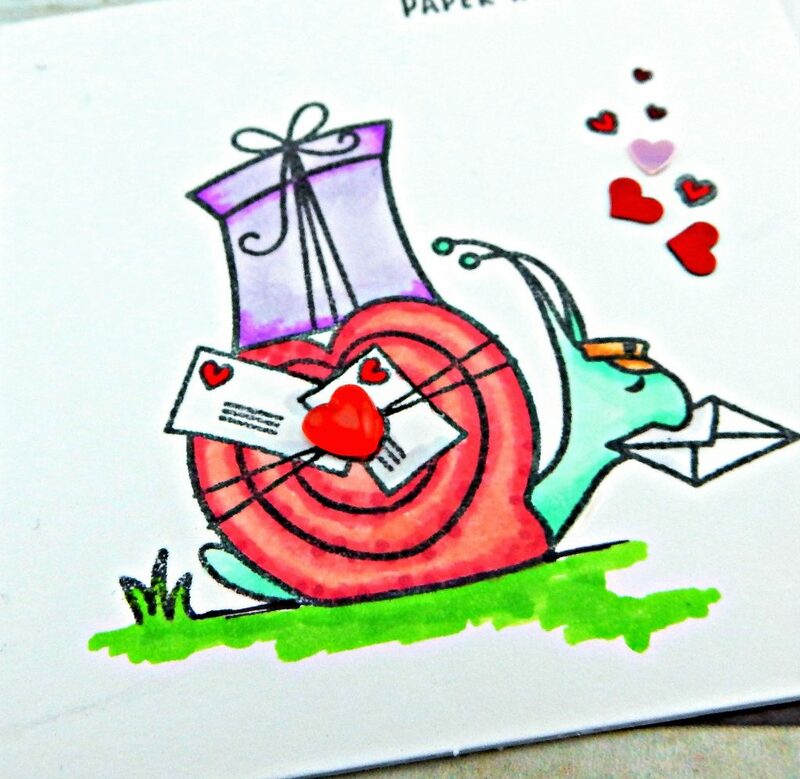 Here is the base creation I started with, it is a fun 2X2 card and envelope, perfect for Mr. Snailman. I stamped our delivery guy directly on the card and the mailbox on the envelope. I added the sentiments, including the word hug in the mailbox. I colored with my Copics. Now honestly, I think this is pretty cute and could be a final product, but I love Trinity embellishments and enjoy adding them where I can. I have this little box of embellishments filled with so many choices, including: PINE-ing For You (wooden hearts, arrows and words); Love is in the Air (specialty valentine mix); A Heart of Gold (Matte and Shiny Gold Hearts); Sweet & Tart Heart Sprinkles (candy confection look-a-likes, there are a huge variety of colors of these hearts); Double Bubble Jelly Drop Hearts (glass hearts, a huge variety of colors). Let’s take a look at what might be fun embellishment choices. 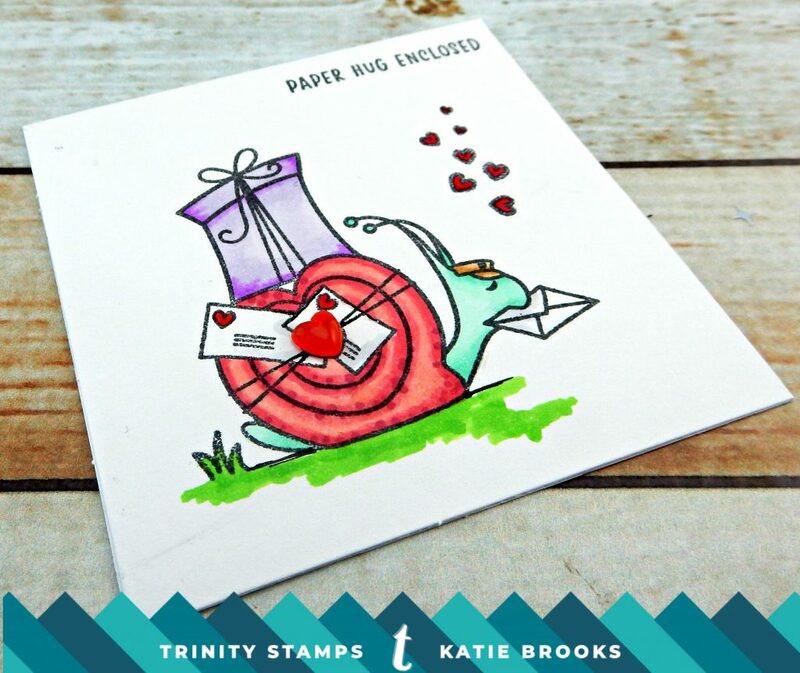 Option 1- This snail has a heart above his mail, the Jelly Drop Hearts are the perfect size to cover them if you align them properly. I used a Cinnamon Red Hot heart that you can see in both the above and below pics. 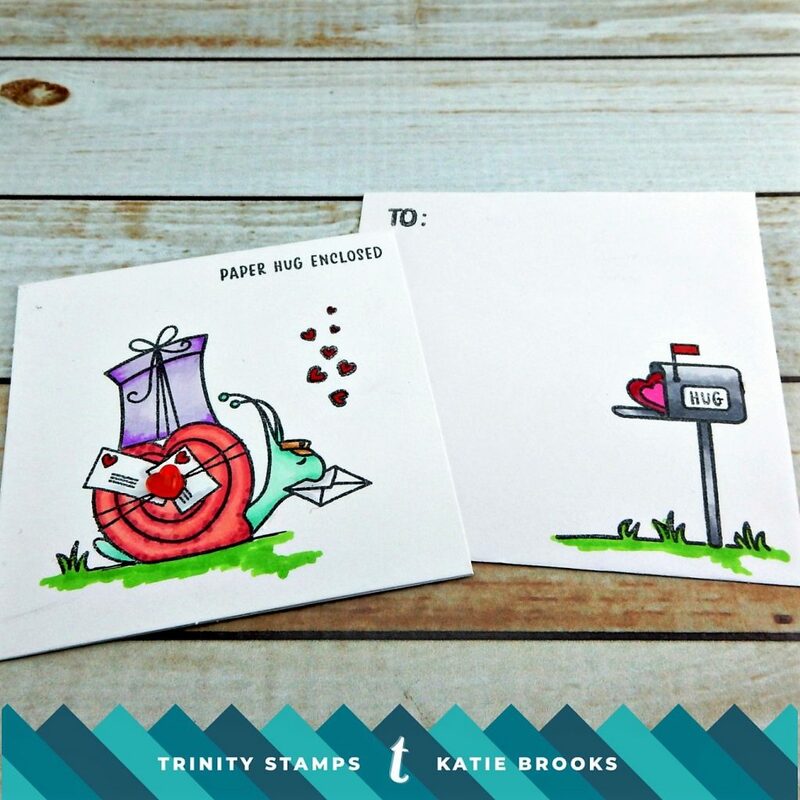 Options 2 & 3- I have stamped a flurry of hearts in front of Mr. Snailman. 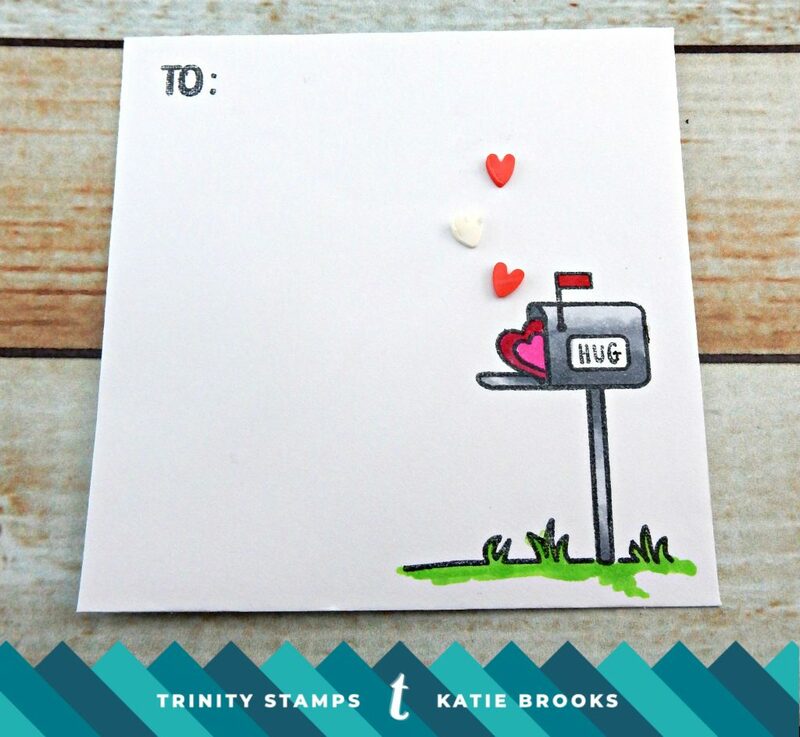 Instead of stamping the hearts I could have used some of the Love is In the Air embellishment mix (or any other mix). Alternately, I can use the mix for some of the larger hearts and leave the little hearts as is, see above. 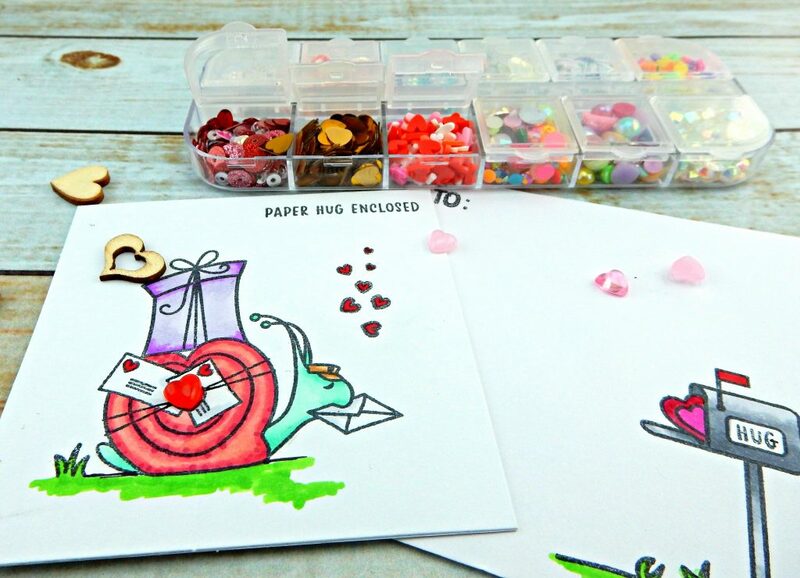 Option 4- Rather than fluttering hearts near Mr. Snailman, I may have chosen to add more hearts fluttering out of the mailbox such as the Sweet & Tart Hart Sprinkles shown below. Option 5- You may have noticed in the above picture that I stamped the word hug on the mailbox. 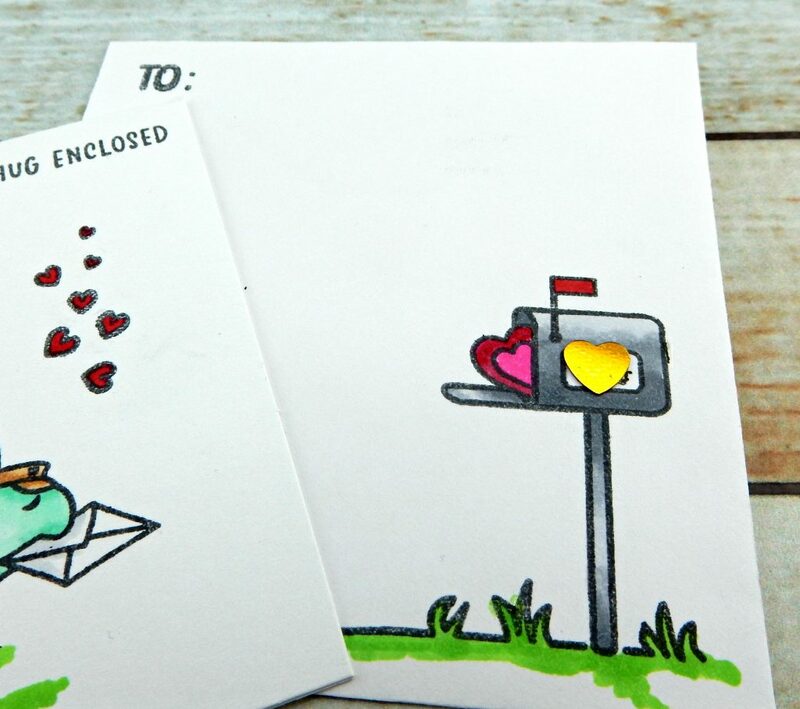 The last option I have to show you is that rather than stamping or coloring that portion, I could have added a gold heart, to this portion of the mailbox. See below. I am sure there are tons of other options as well. Just experiment a little and enjoy! My final card just has the one Cinnamon Red Hot Jelly Drop Heart.